Clematis 'Charissima' has large, single cerise-pink flowers with a deeper pink stripe and pink veins to each of the petals and maroon-red centres during May and June. This wonderful non-evergreen climber with mid-green coloured leaves is particularly pretty and would look lovely grown up a trellis, garden wall, fence, pergola, archway, or allow to ramble through a large shrub or tree. It is also suitable for containers supported with bamboo canes or an obelisk for a stunning display on your patio. 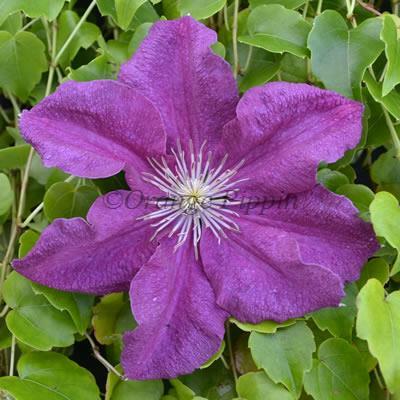 Clematis 'Charissima' was raised by Walter Pennell of Pennell and Sons nursery and named in 1974 by Sheila Gilbert, an employee at the nursery.